Since the inaugural Austin City Limits Music Festival (ACL) in 2002, everything from the number of bands and attendees to the duration of the festival has increased. The festival started with 67 bands performing for 40,000 people over a single two-day weekend and grew to 151 bands performing for 75,000 people over two separate three-day weekends! Over the years, the music stages have been filled by artists such as Dixie Chicks, Willie Nelson, Sheryl Crow and the Eagles along with many more local Austin bands. ACL has once again delivered some of the hottest artists in the music industry to make for what is expected to be the greatest festival to date. Its time now to dot your Is and cross your Ts in the final stages of preparations for this year&apos;s Austin City Limits Music Festival. Here a few tips and reminders on how to help make this the best experience possible for all of you festival goers. Coolers are NOT allowed inside of the festival. Outside food and beverages (with the exception of two factory sealed water bottles) aren&apos;t allowed either. Don&apos;t worry, you can bet Tito&apos;s Handmade Vodka will be available inside along with 30 food trucks! We suggest bringing an empty hydration backpack such as a CamelBak that you can keep filled by using the water filling stations. Stay hydrated! Due to the large amount of people who are coming into town, parking can be a bit of a hassle. For the safety of the festival goers, there is no parking at Zilker Park. Your best options are parking downtown and walking to the FREE shuttle service (located at Republic Square on 4th and Guadalupe), being dropped off or, the ultimate Austinite way, bicycling. You don&apos;t want to forget sunscreen, sunglasses, and a hat. Even though it&apos;s October, Texas weather can be unpredictable. Stay cool and wear layers! One of the easiest ways to make any festival enjoyable is knowing the music and artists before you get there. Share some of your favorite festival experiences by posting on Twitter and Instagram using the hashtags #ACLFest and #TrueAustin! 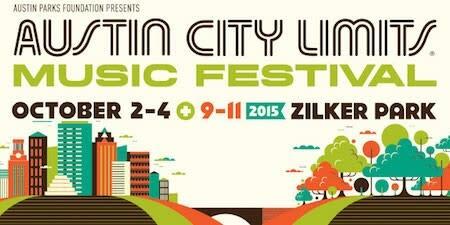 For any and all furthers questions, please visit the Austin City Limits Music Festival page! Contributed by Harrison Holt, Austin CVB MusicMarketing Intern.